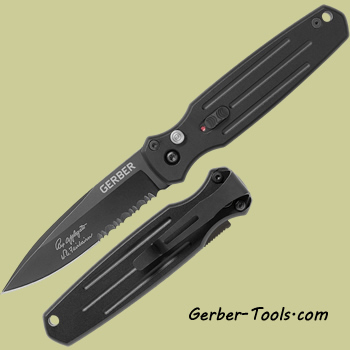 Gerber Mini Covert Automatic 30-000244. Mini Covert Auto, Serrated Edge. 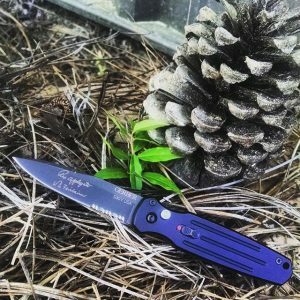 The black blade is made of S30V steel in the USA. It has been signed by Rex Applegate and W E Fairbairn. Blade is 2.75 inches long. Overall length is 6.5 inches. With one push of the button, the blade will fully deploy, keep it locked in with the safety lock feature. Black pocket clip and lanyard hole on the handle. The Mini Covert is smaller than the Covert, but as equally as functional. You will be proud to have this in your back pocket.